You~re a star and nothing~s changed! :wink: Halter necklie with an adjustable tie. Mesh panel and contrast trim add a stylish flair to this top. Elastic band under bust is comfortable and supportive. 87 percent nylon, 13 percent elastane. Contrast: 92 percent nylon, 8 percent elastane. Lining: 86 percent nylon, 14 percent elastane. Hand wash, dry flat. Imported. If you~re not fully satisfied with your purchase, you are welcome to return any unworn and unwashed items with tags intact and original packaging included. You~re a total knockout in this stunning Trina Turk Divertida Dress. 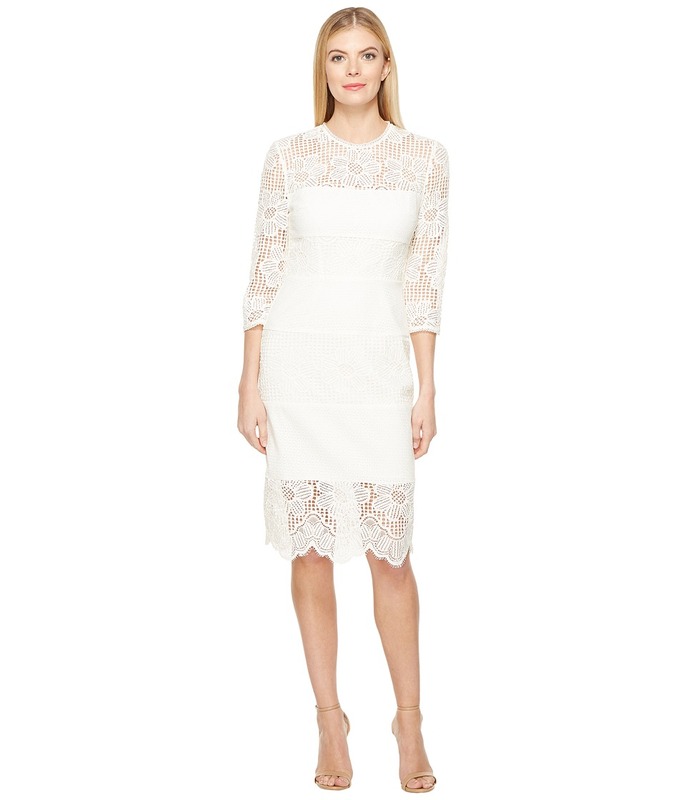 Dress boasts geometric floral lace on a chic sheath silhouette. Round neckline. Three-quarter sleeves. Keyhole with hook-and-eye closure at back. Concealed back zipper. Straight scalloped hemline. Lined. 63 percent cotton, 37 percent nylon Lining: 94 percent polyester, 6 percent spandex. Dry clean only. Imported. Measurements: Length: 42 in Product measurements were taken using size 2. Please note that measurements may vary by size. Glitz and glamour come alive when you wear this Trina Turk Glitterati 2 Dress. Dress boasts stunning beaded designs on a luxe silk crepe de chine. Shift silhouette. V-neckline. Half design. Straight hemline. Fully lined. Pullover styling. 100 percent silk Lining: 100 percent polyester. Dry clean only. Imported. Measurements: Length: 33 1 2 in Product measurements were taken using size 2. Please note that measurements may vary by size. 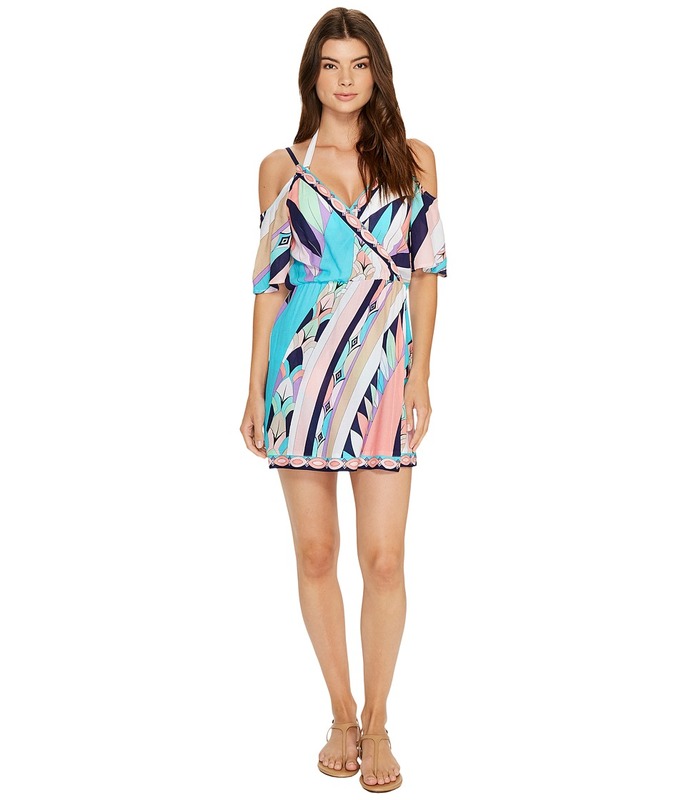 The night never ends in this Trina Turk Lambada Dress. Dress boasts a lightweight crepe fabrication. Cascading ruffle design at sides. Round neckline. Short ruffle sleeves with cold-shoulder detail. Concealed back zip closure. Straight hemline. Fully lined. 100 percent polyester Lining: 94 percent polyester, 6 percent spandex. Dry clean only. Made in the U.S.A. and Imported. Measurements: Length: 34 in Product measurements were taken using size 2. Please note that measurements may vary by size. Keep your warm-weather look on point with this Trina Turk Conga Dress. Dess boasts allover floral lace for a feminine feel. Shift silhouette. Halter neckline with adjustable back straps. Straight hemline with scalloped trim. Lined. Pullover styling. 100 percent polyester Lining: 94 percent polyester, 6 percent spandex. Dry clean only. Made in the U.S.A. and Imported. Measurements: Length: 39 in Product measurements were taken using size 2. Please note that measurements may vary by size. 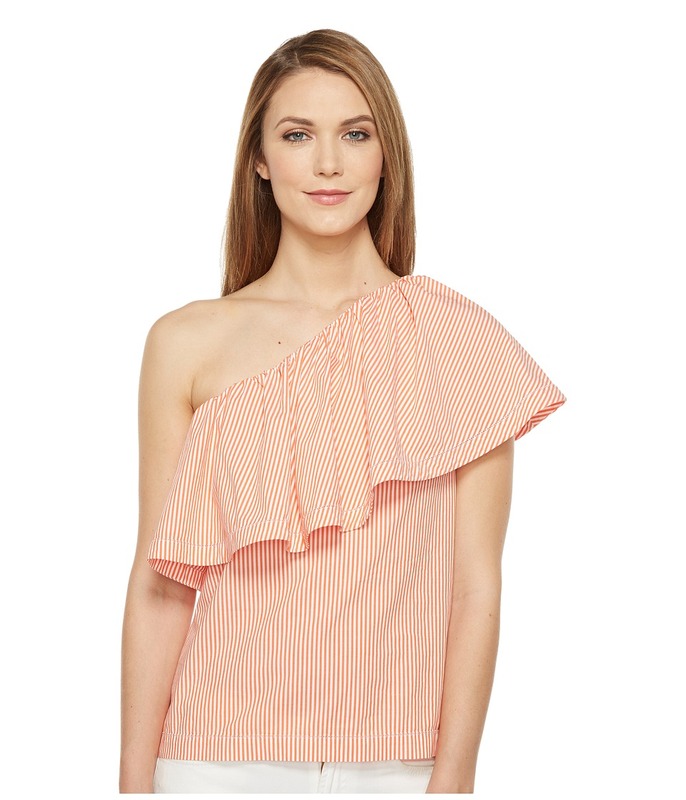 Effortlessly elevate your warm-weather look in this Trina Turk Mayreau Top. Fabrication from classic shirting for effortless wear. 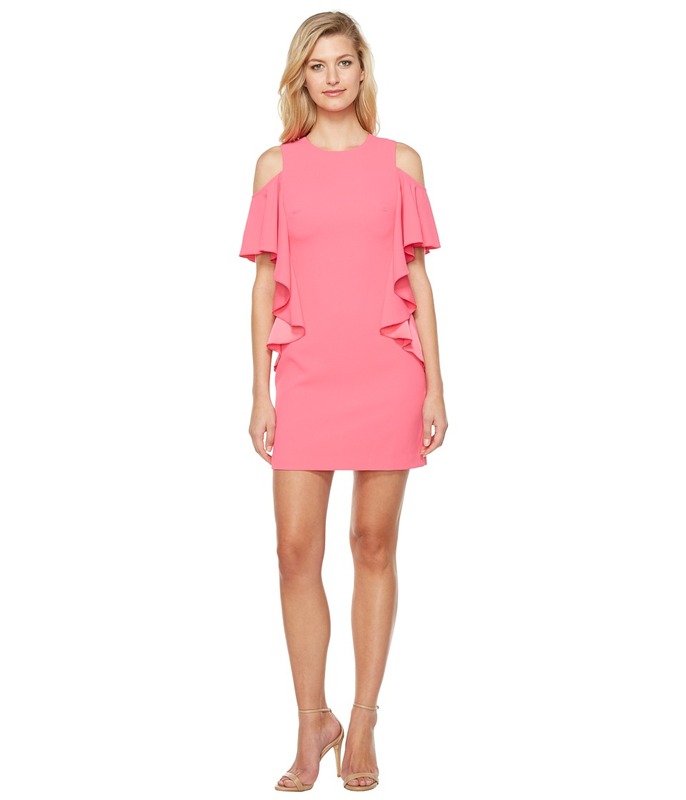 Single shoulder silhouette with dramatic ruffle detail. Asymmetrical neckline with elastic trim. Concealed side zip closure. Straight hemline. 96 percent cotton, 4 percent elastane. Dry clean only. Imported. Measurements: Length: 26 in Product measurements were taken using size SM (US 4). Please note that measurements may vary by size. 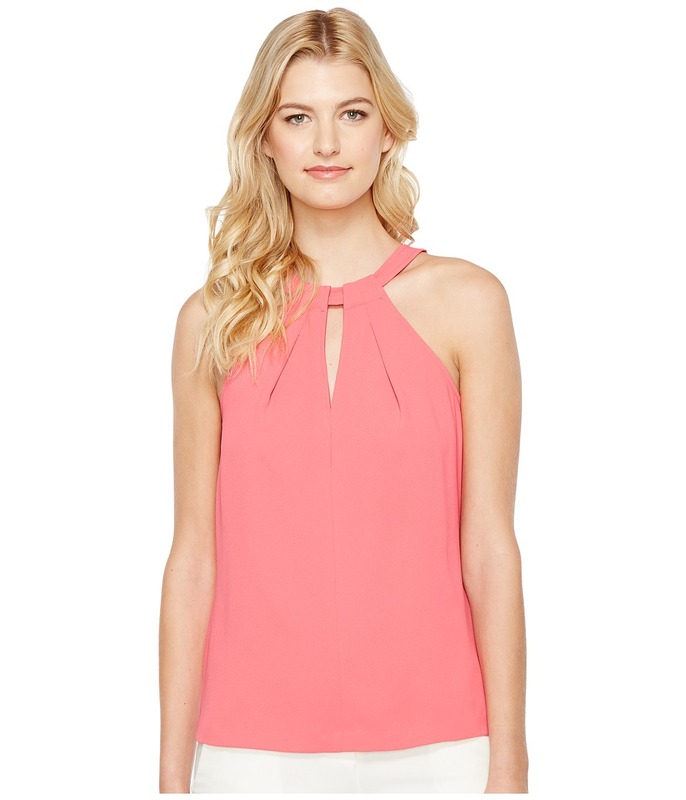 Show off your sun-kissed shoulders in this standout Trina Turk Quince Top. Top boasts a lightweight crepe fabrication. Halter neckline with keyhole detail at front and back. Double button closure at back neck. Inverted pleats highlight the front and back yokes. Sleeveless design. Straight hemline. 100 percent polyester. Machine wash and dry flat. Made in the U.S.A. and Imported. Measurements: Length: 26 in Product measurements were taken using size SM (US 4). Please note that measurements may vary by size. Slip into this sensual swimwear and luxuriate in the uncrowded waters found long after the sun goes down. One-piece swimsuit in a colorful floral print. Deep V-neckline boasts a fixed tab with gold-tone hardware. Removable contour pads provide support and shape. Adjustable halter tie. Hook closure at middle back. Moderate rear coverage. 83 percent nylon, 17 percent elastane. Lining: 84 percent nylon, 16 percent elastane. Hand wash, line dry. Imported. If you~re not fully satisfied with your purchase, you are welcome to return any unworn and unwashed items with tags intact and original packaging included. Slip into this sensual swimwear and luxuriate in the uncrowded waters found long after the sun goes down. One-piece swimsuit in a colorful floral print. Deep scoop front and back neckline. Shelf bra and removable contour pads provide support and shape. Fluttery sleeves add breezy appeal. Moderate rear coverage. 83 percent nylon, 17 percent elastane. Lining: 84 percent nylon, 16 percent elastane. Hand wash, line dry. Imported. If you~re not fully satisfied with your purchase, you are welcome to return any unworn and unwashed items with tags intact and original packaging included. Shock ~em out of their poolside lethargy with this electric swimwear! One-piece swimsuit in a swirling stripe with eclectic prints. Plunge V-neckline. Removable contour pads provide support and shape. Belted empire waist with gold-tone U-shaped hardware. Fixed X-back straps. Moderate rear coverage. 83 percent nylon, 17 percent spandex. Lining: 84 percent nylon, 16 percent elastane. Hand wash, line dry. Imported. If you~re not fully satisfied with your purchase, you are welcome to return any unworn and unwashed items with tags intact and original packaging included. Shock ~em out of their poolside lethargy with this electric cover-up! Tunic in a swirling stripe with eclectic prints. Deep V-neck at surplice bodice. Cold-shoulder sleeves with adjustable shoulder straps. Elastic waist hugs the body. Straight hemline. Slip-on design. Swimwear not included. 100 percent rayon. Hand wash, line dry. Imported. Measurements: Length: 33 in Product measurements were taken using size SM. Please note that measurements may vary by size. Upgrade your attire with this Trina Turk Basinger Top. Top flaunts a crisp polished shirting for effortless wear. 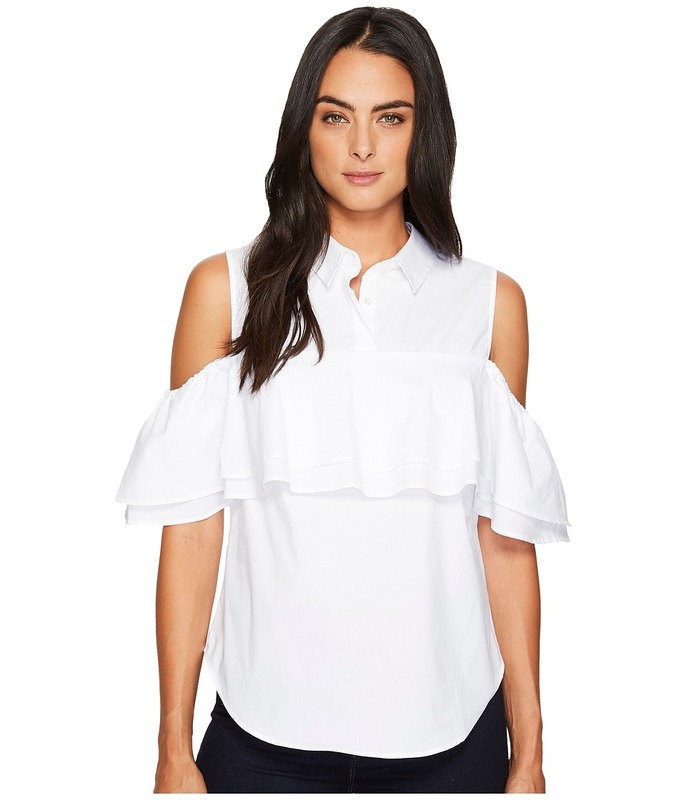 Cold-shoulder top flaunts a flouncy ruffle detail across the front and sleeves. Fold over collar. Short sleeves. Keyhole with hook-and-eye closure at nape. Straight hemline. 96 percent cotton, 4 percent elastane. Dry clean only. Imported. Measurements: Length: 25 in Product measurements were taken using size SM (US 4). Please note that measurements may vary by size. 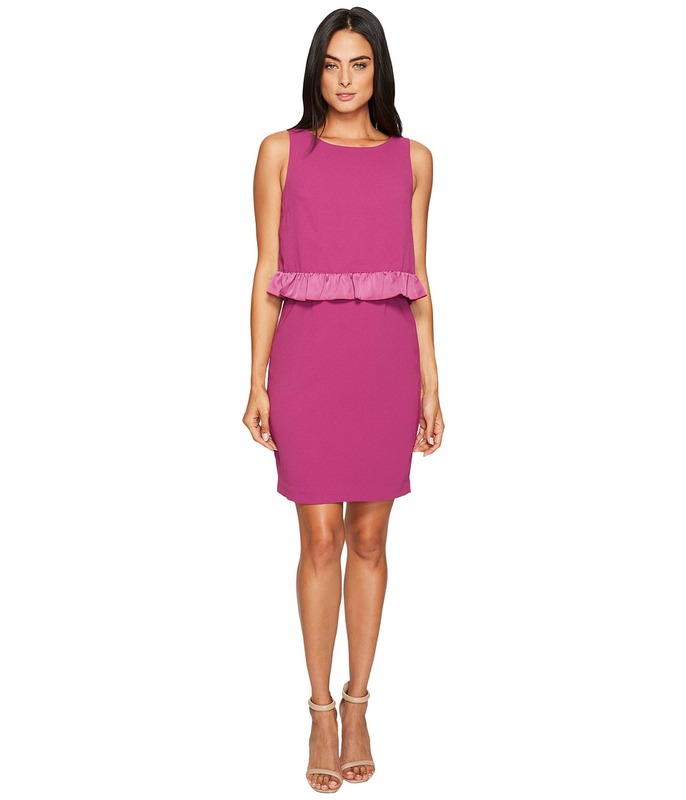 Steal the show in this standout Trina Turk Tiedges Dress. Dress flaunts a mid-weight fabrication on a semi-fitted silhouette. Whimsical popover detail features a ruffle trim at waist. Round neckline. Sleeveless design. Concealed back zip closure. Straight hemline. Lined. 100 percent polyester Lining: 94 percent polyester, 6 percent spandex. Dry clean only. Made in the U.S.A. and Imported. Measurements: Length: 37 in Product measurements were taken using size 2. Please note that measurements may vary by size. 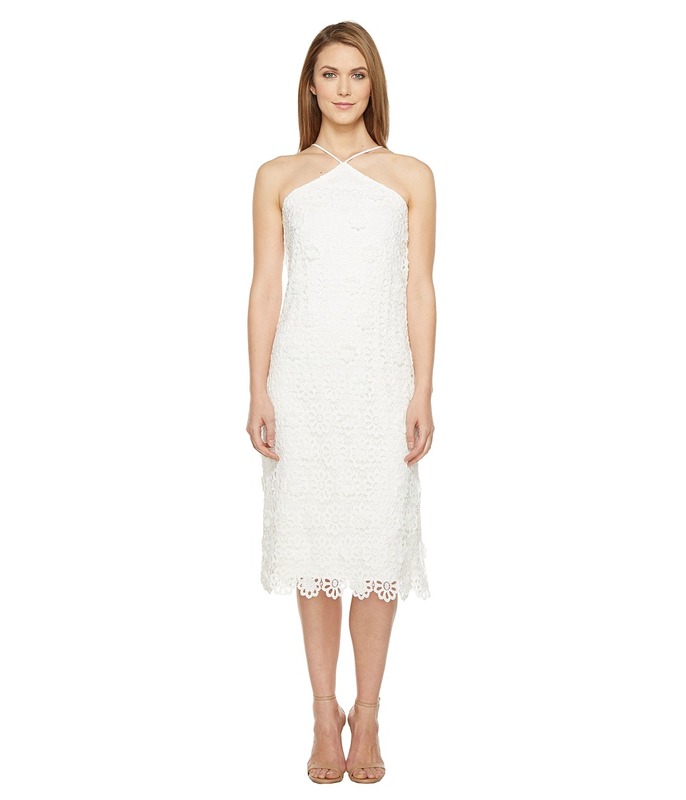 Effortlessly craft the perfect look with this Trina Turk Sebastian Dress. Dress flaunts a flattering fit-and-flare silhouette. Structured ponte fabrication. Lace detail at front and back yoke. High neckline. Long sleeve design. Keyhole at back with concealed zip closure. Straight hemline. Lined. 69 percent rayon, 29 percent nylon, 2 percent spandex Contrast: 48 percent metallic, 37 percent cotton, 15 percent nylon Lining: 94 percent polyester, 6 percent spandex. Dry clean only. Imported. Measurements: Length: 35 1 2 in Product measurements were taken using size 2. Please note that measurements may vary by size. Slip into this sensual swimwear and luxuriate in the uncrowded waters found long after the sun goes down. Bralette bikini top in a colorful floral print. Scoop neckline. Fixed tabs with gold-tone hardware link the cups. Removable contour pads provide support and shape. Adjustable shoulder straps. Hook closure at middle back. Bikini bottom not included. 87 percent nylon, 13 percent elastane. Lining: 84 percent nylon, 16 percent elastane. Hand wash, line dry. Imported. If you~re not fully satisfied with your purchase, you are welcome to return any unworn and unwashed items with tags intact and original packaging included. Shock ~em out of their poolside lethargy with this electric swimwear! Tankini in a swirling stripe with eclectic prints. Scoop neckline. Removable contour pads provide support and shape. Adjustable halter tie. Hook closure at middle back. Pointed front hem. Bikini bottom not included. 83 percent nylon, 17 percent elastane. Hand wash, line dry. Imported. If you~re not fully satisfied with your purchase, you are welcome to return any unworn and unwashed items with tags intact and original packaging included. Shake your groove thang by the water in the dynamic Disco Deco Bralette! Bikini top in an art deco-style print. Scoop neckline. Removable contour pads provide support and shape. Gold-tone hardware accents the adjustable shoulder straps. Hook closure at middle back. Bikini bottom not included. 80 percent nylon, 20 percent elastane. Lining: 90 percent nylon, 10 percent elastane. Hand wash, line dry. Imported. If you~re not fully satisfied with your purchase, you are welcome to return any unworn and unwashed items with tags intact and original packaging included. Shake your groove thang by the water in the dynamic Disco Deco V-Plunge One-Piece! Bikini top in an art deco-style print. Polished gold-tone hardware accents the plunge neckline. Removable contour pads provide support and shape. Dramatic open back with twist accent. Adjustable halter tie. Moderate rear coverage. 80 percent nylon, 20 percent spandex. Hand wash, line dry. Imported. If you~re not fully satisfied with your purchase, you are welcome to return any unworn and unwashed items with tags intact and original packaging included.